Current UNSW Law Student with a Bachelor in Economics and Social Science. I am also a law clerk with Redfern Legal Centre and an intern with Results Australia. I'm not an expert, just a bemused observer with a fondness for politics, fine wine and strong coffee. I identify as a social progressive, but I admire all forms of well articulated economic and political thoughts across the spectrum. I'm particularly interested in economic policy, the need for taxation reform, social justice and commercial law reform. If you're expecting intellectual political analysis, you've come to the wrong place. Views are my own, but can be yours for a monthly fee of $14.95. The Abbott Government recently announced that AusAid will be subsumed into DFAT in a bid to reduce “duplication and waste” across the public service. 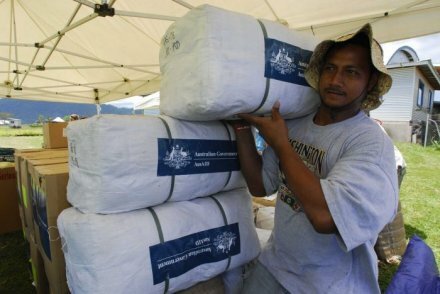 The decision to integrate AusAid into DFAT will have clear implications upon aid delivery. First, this represents a considerable cut to DFAT and AusAid. The AusAid Director, General Peter Baxter has already resigned in response to the reforms. It is expected that the merger will affect 1300 AusAid employees, who will see their numbers dwindle by way of “natural attrition” (SMH: 2013) These fears are enhanced after the then opposition announced it could make cuts totaling $4.5 Billion over the next three years. It is, however, unclear what this means for Australian aid recipients. Some analysts are expecting that this will mean our aid delivery will become more closely aligned to our diplomatic objectives. Surely this can’t be a bad thing – aid has been traditionally been used to further diplomatic objectives and build relationships with key strategic regions. At least, this is how aid has been traditionally been used as a foreign policy tool. Consider the Marshall Plan, developed by the US after World War Two, which saw the rebuilding of Europe. Or the favourable trade and aid policies afforded to East Asian nations, such as Japan and Korea. That was a mutually beneficial relationship – The US gained access to invaluable growing markets and the recipients were able to benefit from favorable trade conditions and millions were lifted out of poverty as a result. Unlike many aid organisations, I’m not entirely sold that this is a terrible idea. But then again – this largely is dependent upon how you define “aid” and what its purpose is in the global economy. You see, some hippies like the Chief Executive of World Vision, Tim Costello, believe that Aid is for the betterment of mankind. Costello has a tendency to go on about “helping the poor” or some other hippy nonsense about feeding the hungry. (ABC News: 2013). Generally, this argument is entrenched in the heats and minds of do gooders who believe that people shouldn’t live in absolute poverty. They argue that we have a duty, as members of the developed world, to help those in need. If that warm, fuzzy stuff doesn’t get you, these Aid loving freaks also suggests that this severely undermines our credibility on an international stage. Archie Law from ActionAid is a proponent of this argument – that by linking aid with trade we are effectively lowering our reputation internationally. He bases this ridiculous assertion on a few telephone calls with key international players, and the way the UN treated him when we had this policy presumably under Howard. (Radio Australia : 2013) Sure, whatever Mr Law, you my good sir are a Law unto yourself. Correct me if I’m wrong, Mr Sheridan – but isn’t landing a seat on the UN security council in our national interest? Isn’t it in our national interest to develop a benevolent reputation in the international community? To show that we have a commitment to improve the global economy and combat poverty? On a serious note however, I do agree that we need to refine how we distribute our aid. Big aid doesn’t always mean effective distribution and I concede he makes a valid point about needing to target where we allocate our funds. Perhaps we will be able to achieve greater economies by integrating AusAid with DFAT. Perhaps the Abbott Government will push for a stronger, regional focus where our money can be effectively monitored, managed and used to the betterment of the Asia-Pacific region. As it presently stands, I’m not sold, especially with Abbott’s disappointing announcement of cuts to foreign aid. But that’s not to insinuate it might not happen, after all, I live in perpetual hope. The central problem of these reforms is that the focus is not about making aid more effective, but about pushing aid further off centre stage, while blurring the lines of accountability. I for one am disappointed – Australia should have a positive role to play in the global community. I quietly hoped that Abbott’s catholic values of charity and loving thy neighbor would shine through. I was wrong. But we have three years for me to be proved otherwise. If you want to know more about aid and why it matters, be sure to check out organisations such as Oxfam, Care Australia, RESULTS Australia or ActionAid. If you don’t want to know more, be sure to read The Australian. Law note sharing at its best!